When you don’t have a home, don’t have a kitchen, don’t have any way to prepare even the most basic meal, Maggs is an essential lifeline. Our staff and volunteers prepare healthy, simple food for homeless people, including breakfast and lunch, currently five days a week. Read more. Nobody likes getting caught out in the rain: soaked to the skin and chilled to the bone. But if you are homeless, with no way of drying out and warming up, bad weather can be a nightmare. Thankfully, Maggs is there with a much-needed and very welcome change of clothes. Read more. Worcester Community Lottery worcesterlottery.org	Worcester Community Lottery - a fun and easy way to support good causes in Worcester! One week ago! But you are still able to donate! If you or a group of colleagues would like to do something of real value in the local community, please consider helping out at Maggs Day Centre. 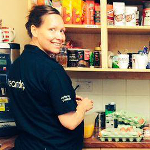 Whether you’d prefer to help out cooking breakfast, painting and decorating or mentoring a homeless person, there are many ways you can make a difference, either one-off or more regularly. Thanks to all your brilliant work, we have received The Queens Award for Voluntary Service. Read more. We benefit greatly from financial and practical assistance from local companies. Please contact our manager, Mel Kirk, on 01905 25027 or by email to discuss ways to help. See how others are helping. 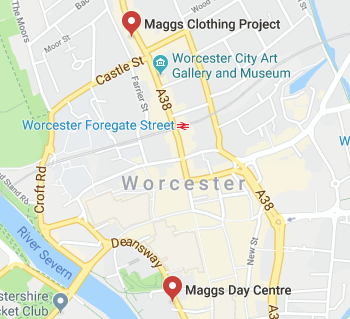 Our activities are split across two locations: Maggs Day Centre (Deansway) and Maggs Clothing Project with the office and activity centre (The Tything). If you would like to donate through your business or discuss other ways you could help, please contact us by email or on 01905 25027.